299,00€ tax incl. 299,00€ tax incl. Buy your VICTRON ENERGY AGM Deep Cycle 12V/110Ah batteryfor the best price online. The AGM batteries are favoured when there is a strong current in-rush, for example, when starting an electric motor or pump. It's vital to to carry out a full charge each week to assure its longevity and not to go over 30% of depth of discharge. Use only at 25°, incase of a high heat, consider burying it. 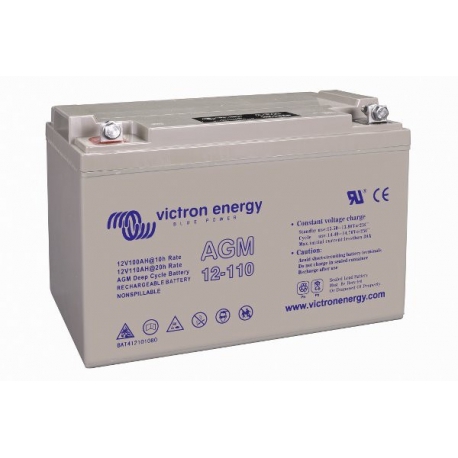 AGM Battery: The VICTRON ENERGY AGM battery has AGM technology, abbreviation of Absorbent Glass Mat. In these batteries, the electrolyte is absorbed by capillarity in a fibreglass matt between the plates. They are better adapted than Gel batteries to provide very high currents for short durations (particularly when starting up). Life cycles: 700 : With a depth of discharge of 50%, the VITRON AGM battery lasts approximately 700 cycles. We estimate the lifespan of this battery to be between 2 to 3 years for a photovoltaic use (we consider between 250 and 350 cycles per year). Storage capacity: 1320 Wh: VICTRON batteries offer a capacity of 1320Wh to meet your needs. That is equivalent to 1320W during 1 hour. If this capacity isn't enough, add these same batteries to your basket. Capacity can be added very simply.